Heathcote is a rural township in central Victoria, 105 km north-west of Melbourne and 40 km south-east of Bendigo. It is on the Northern Highway. Apart from pastoral runs in the Heathcote district, settled occupation occurred when gold was discovered at the McIvor Creek, a stream running between two ranges and along which the Heathcote township was later laid out. By early 1853 a substantial gold field settlement existed, called the McIvor diggings, with estimates of population varying between 16,000 and 40,000. By the next year there were about 2000 people, as diggers moved on. 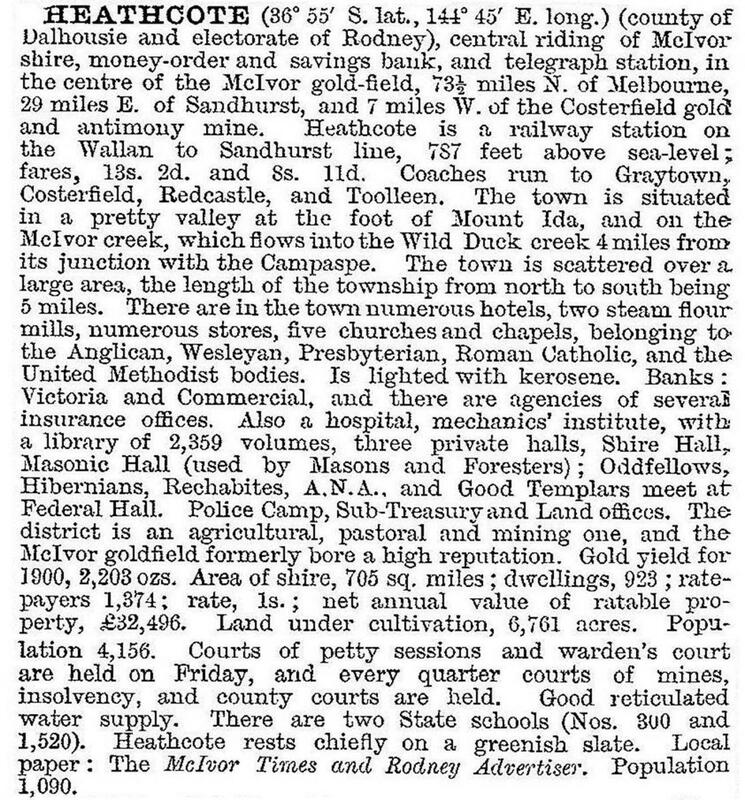 The first land sale was in January 1854, when the township was named Heathcote. In that year a National School and the Anglican church were opened. By the end of the 1850s there were also Presbyterian and Wesleyan churches, regular Catholic services and a hospital (1859). A permanent Catholic church building was constructed in 1865. The Heathcote borough of 1410 ha was created in August 1859, and the surrounding McIvor shire in 1864. A combined court house-town hall-council offices was built in 1863, and probably remains the most eye-catching group of buildings in the town. During the 1880s when railways expansion was at its zenith, a line was opened between Heathcote Junction (near Wandong on the main line from Melbourne to Seymour) and Bendigo. The line opened up transport opportunities to Bendigo, particularly for wood but from the Heathcote forests. Good timber was used for mine props, railways work and telegraph poles, and poorer stuff for firewood. In many respects the railway was a timber line. A tramway from forests in the Costerfield area joined the railway at McIvor siding, south of Heathcote. Heathcote grew in an elongated shape along the High Street/McIvor Creek axis. ‘North’ and ‘South’ Heathcotes developed, along with a sense of social difference between the two which reputedly lasted until the 1980s. There was a State primary school (1875-1946) at South Heathcote. Between 1900 and 1970 the town’s population fell from about 1300 people to 1080. Partly, the fall reflected the end of gold sluicing and the decline in the timber trade. The ‘timber line’s’ connection between Heathcote and Bendigo was closed in 1958. On the section from Heathcote to Heathcote Junction passenger services ended in 1965 and the freight service ended in 1968. Within a decade however, the town’s population began to grow as it came within commuting distance of outer metropolitan Melbourne. Three vineyards were planted near Heathcote between 1976 and 1979. These events coincided with a proposal by the State Government to establish a toxic liquid-waste dump at the Dargile forest about 12 km north-east of Heathcote. A Heathcote Citizens Action Committee was formed. Ultimately the proposed dump was not proceeded with. Heathcote has State and Catholic primary schools, three churches, a hospital, a showground, the McIvor Historical Society, saleyards, a caravan park on the McIvor Creek, a swimming pool, a golf course and two ovals. The pink cliffs conservation area, caused by gold sluicing, is south of the school. There is also a conservation area on the Register of the National Estate, comprising two blocks bounded by High, Jennings, Hospital and Herriot Streets. It contains numerous notable homes, hotels, churches, the former municipal offices and a former flour mill. A powder magazine (1864), north of the town, is also a registered building. There are lookouts at Viewing Rock and further north at Mount Ida. 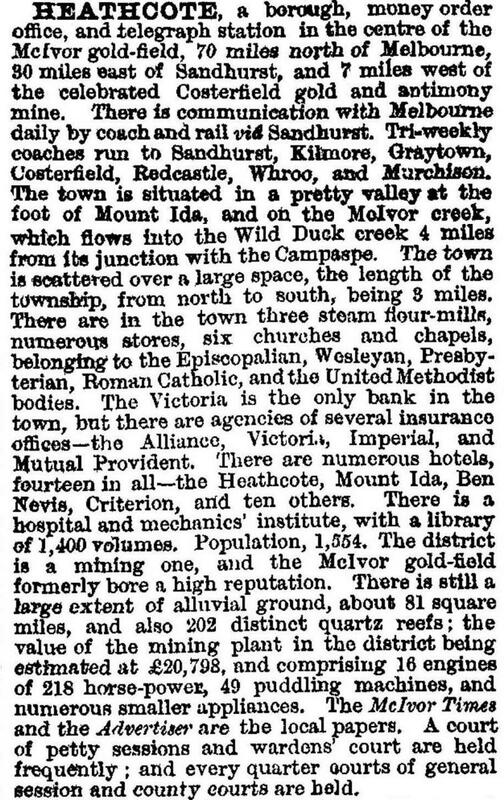 The McIvor Times (1858) continues as a weekly publication. The Heathcote District Football League consists of 9 clubs from Gunbower to North Bendigo. Plans for a natural gas connection to the town were confirmed in 2014. Heathcote was connected to the NBN in 2014. At the 2011 census, the median age of residents was 55, compared with 37 for Australia.